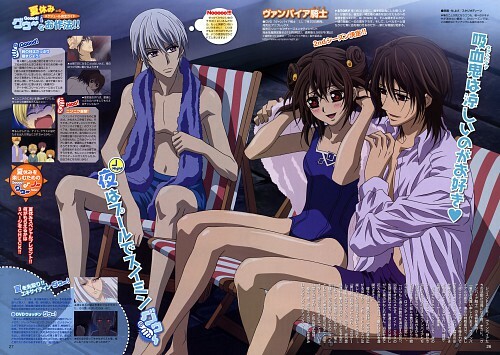 Vampire Knight: Swimsuits in VK? Minitokyo »	Vampire Knight Scans » Vampire Knight: Swimsuits in VK? This is mine to vector!If someone makes it before me,I'll kill him/her! AHH! 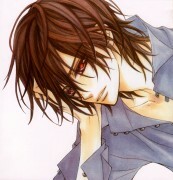 HOOt KaName-senpai look so a very handsome! i love this beatiful boy! and yuki soo kawai! i am a lovely fan of kanane & Yuki! KawaI! ahhh zero is funni look so pretty! thank you for pretty scan! Thank you! Thank you! I was hoping for a night class bathsuit pic, and now here is Kaname, yheeeeee! i wish we had fun service like this in the anime..
That is such a great scan! *nose-bleed* Kaname take the shirt off! Totally awesome scan and I appreciate it. I'll try to clean it up and do something with it. Zero looks really funny here for some reason by the way. HAHAHA! I WANT KANAME TO BE SHIRTLESS! *cough cough*<--crazy kaname fan here! well, i heard that Zero is just less shy. I mean, I cant picture Kaname taking his shirt off boldly like Zero. That would definetly ruin his cool pure-blood image <--hahahaha. Zero's all like, "You pure-blood bast**d, take your hands off MY YUUKI!" Kaname's all like, "She's so cute when she blushes... You like THAT, Zero? Yeah, that's right... she's all mine..."
And Yuuki's like, "omg omg omg omg OMG! ^///^"
OMFG SOOO CUTE! I'm a crazed kanamexyuki-tard!God, Kaname is looking so tender and sweet at Yuki. ^.^ Zero's like "WTF KANAME?! I want to set next to Yuki!" 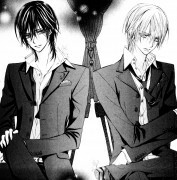 As lilmaggie22 said - there are definately reasons for Kaname retaining his shirt. Clothing is a form of modesty, and having Kaname shirtless would appear undignified and uncharacteristic of his personality. Zero's facial expression in this is priceless though. Okay, Zero's "Noooooo!" is damn funny xD! This scene is so funny yet romantic between kaname and yuuki.